It is not very often that one gets the opportunity to spout forth about the things that really matter to a willing, interested, patient and above all curious listener! 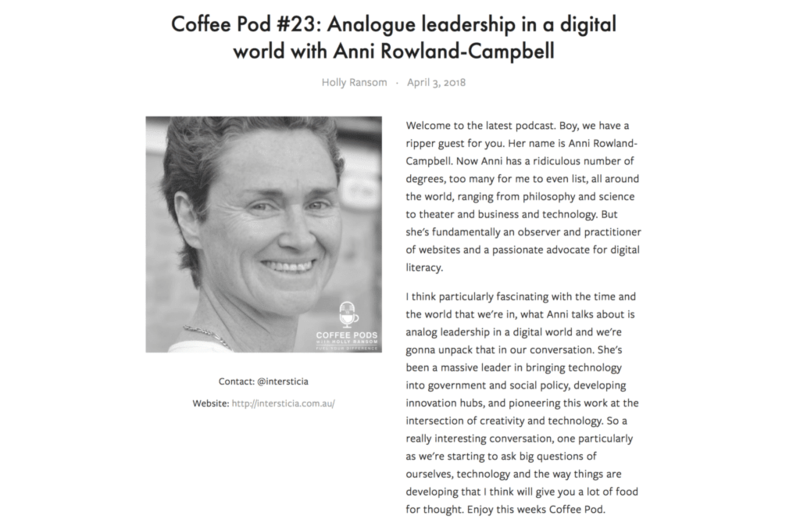 I have had just such an opportunity with Holly Ransom in her Coffee Pods interview. I was introduced to Holly through Lydia Hascott who is helping us with Brave Conversations London, and I enjoyed the conversation enormously … apart from having to seek a quiet place in my house away from birds and the odd Pittwater chain saw! The interview pretty much speaks for itself but I would like to publicly state my thanks to Lydia for the introduction, and to Holly for her insightful questions and infectious enthusiasm as I rambled on.